I believe that it was on New Year's Day when a friend recommended "Man on Wire". She said that she had thought of me while watching it with friends on New Year's Eve. She thought that I might like to see it. When I went to the video store, all the copies were rented out. On the day before yesterday, I rented "Man on Wire" and watched it yesterday afternoon. There was something that made me think of this video. The black suit, the tall hat, the juggling, the scenes on the bridge. misinterpreted. it will not change. t' them, they will commit suicide. you, he will not ask you again . 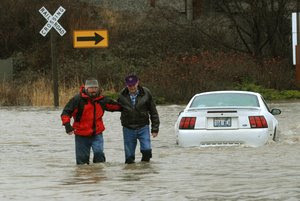 . .
After days and days of snow and unusually cold weather, we are experiencing our usual January weather, and that has caused some flooding in parts of Bellingham and Whatcom County. This is the first time in my memory that schools have been closed because of flooding in various areas of Whatcom County. I recommend "Man on Wire." lots of water here too Am. I was gong to see Slumdog Millionaire, but I think I probably won't now. I can't bear to see violence on the big screen (so you know I rarely go to see films anymore). Hope you are okay up there with all the crazy rain and flooding. Thinking of you.